A few days ago CBS broke the story on a new and shocking journal article. Naturally they only told half the story. To save your life (literally) I’ll tell you the half they left off. 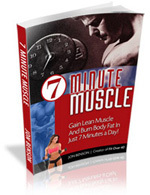 Jon Benson’s book “7 Minute Body” (also called “7 Minute Muscle”) is on sale for 61% OFF for the next 7 days. He does a yearly promo for the book in July (the 7th month… go figure!) as a bit of help for my readers who want the books and the 6 videos that come with it (online) but need a break on the price. There’s a kernel of truth to this… but a lot of falsehood. Researchers reported their findings of a 14-year male and female-based study on exercise, sitting down while working or watching TV for more than 6 hours a day, and mortality rates in the American Journal of Epidemiology. And most Americans sit for about 11 hours… yikes. or workout plans less than 24.5 MET-hours per week. The first bit you know all about: Nutrition. Exercise ONLY works if you have a dietplan that works. “MET” stands for Metabolic Equivalent of Task. This is the energy and oxygen required by the body in the form of exercise to do a specific task as compared to the body at rest. The body at rest has an MET of 1, roughly speaking. Jon’s style of training, “7 Minute Body”-style, Phase 2 to be specific, has an MET of about 12. TWELVE. And that is two 7-minute bouts, totaling 14 minutes flat in the gym (or at home.) This is done 4 days per week. He simply follows that by either GXP cardio and brisk walking at least 5 days per week. The walking takes about 50 minutes; the GXP only 9. That’s IT… and he is a fitness guy… you know, magazines… photo shoots… competitions? Yeah. That kind of fitness guy! The funny thing is that ANYONE using Phase 2 (and there are grandmothers using it) will have the same MET ranking. And my MET-hours per week? 32! This is WELL over and above the average person who is working out LONGER, but not SMARTER. That’s the key behind the 7MB and 7MM Systems… SMART training, but BRIEF training for maximum muscle shape and definition. And, if Jon’s health is any indication, the program solves the sitting problem nicely. He told me he sits at least 12 hours a day. He works at a computer (all sitting) and relaxes at night (usually sitting). But his intense workouts solve the problem sitting causes… and his nutrition plan takes care of the rest. So now you can do the same… and this week only (the next 7 days) you can do it for 61% off.